So the first of the featured artists from this years Frieze Fair is Marcus Coates. Coates is acting as a modern day Shaman, trying to find answers to questions such as 'How can the city control illegal bicycle parking and 'Where does hair go when you go bald? He does this by delving into a place called the 'Lower World' which is inhabited by various birds and animals. 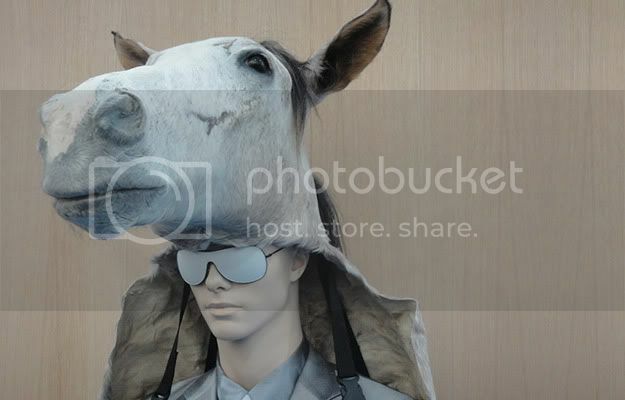 Whilst browsing through the galleries i came across this horse headpiece which turned out to be one of Coates' shamanistic costumes, i love the reinterpretation of the shaman as a westernised modern urbanite. To really appreciate what he's up to i really recommend watching this video from the Tate also clicking on the images below will take you to the video, i want you all to watch it that much.